The story of Uru‘s development is a tangled and troubled one. After Riven, the sequel to Myst, the newly-renamed Cyan Worlds set out on a mission. The initial concept was D’ni In Real Time, or DIRT, which expanded into MUDPIE: Multi-User DIRT Persistent Interactive Environment. For five years, the company worked to develop the game. Myst 3 and 4 were farmed out to other development teams, while millions were spent on the unheard-of: a massively multiplayer adventure game. When Cyan started, Ultima Online was the state-of-the-MMO-art. During development, Everquest, Dark Age of Camelot, and Eve Online were released. While the game was planned to be multiplayer-only, the publisher, Ubisoft, convinced Cyan Worlds to make a single-player portion as well. Tens of thousands of players participated in a beta test of the online Uru Live, which was plagued by lag; personally, I suspect Cyan’s vision exceeded their technology. The single-player version was released, with the multiplayer delayed. Then, finally, the multiplayer was canceled due to lack of projected subscribers. Uru Live was dead. Did I say finally? Hardly. Some of the content that was in the pipeline for the online game was put in a pair of expansion packs. 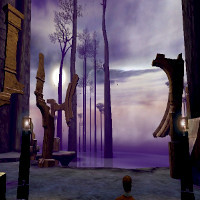 The rest was used to create the single-player Myst 5, which provided a conclusion to the storyline started in Uru. 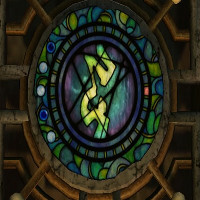 It seemed like Myst was dead, until Cyan created a project called Untìl Uru in 2004. It allowed the hosting of unofficial fan servers, and eventually allowed for D’mala Shard, an official Cyan server for the old Uru Live content. This foreshadowed the 2007 rebirth of the game as Myst Online: Uru Live, with the funding and support of GameTap. However, Cyan had used up all of their content with expansion packs and sequels. New content came, but it came slowly, and the issues of lag seen years before were only partially addressed. After a year, MOUL was canceled. Only recently has Cyan managed to revive Uru in a free (donations requested) format. All the content is there, along with some of the instability and slowness. So, again: why do we care? Because Uru is special. Yes, it is about puzzle-solving and chatting in pretty environments. If it were just an MMO adventure game, that would be notable. But Uru is also presented as a real place, where roleplaying is encouraged and, in theory, an ongoing storyline drives the evolution of the game. The game’s fiction revolves around the cavern city of D’ni, which is below the New Mexico desert and has been excavated by the D’ni Restoration Council. This group of scientists and administrators is focused on the safe, careful exploration of the ashes of the D’ni civilization. Meanwhile, the heir of the D’ni, Yeesha, a mystic rarely seen outside of recordings, has summoned explorers to take a mysterious Journey through the ages of the D’ni. This provides a conflict; Yeesha uses strange mystical techniques and devices that the DRC doesn’t understand or endorse. Meanwhile, the Bahro, a sentient, non-human race enslaved by the D’ni, seems to be not as dead as their masters. The original intent was for this story to play out In-Cavern (a gloss of In-Character), with explorer (player) decisions guiding the outcome and actually determining details of content releases. In URU, as the marketing says, You Are You. You are invited to play yourself, as if you were really exploring this lost world. We have never seen the game fulfill its potential. 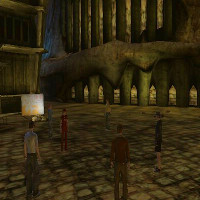 The plot presented in the beta and the GameTap version was thin; NPCs made appearances in the cavern to make dramatic announcements. However, because the funding was low and these NPCs were played by real people in real time, they appeared rarely, and players mobbed them whenever they did show up. The strain of hundreds of avatars in one courtyard brought the server to a crawl, and the conversations were so chaotic that the NPCs could only answer a minute fraction of the questions presented to them. The much-advertised opportunity to choose never really materialized; at one point, players could “choose” whether to help light the cavern or not, but each player’s influence was tiny, and it was never quite clear why the choice mattered. The ages released were tiny at first, and while Cyan released some substantial offerings at the end of their GameTap run, they never lived up to the dreams of what could have been. So what do we have, then? In Uru, first and foremost, we have a world. This is a game steeped in the environment. It is akin to Knytt or Shadow of the Colossus: a space to be explored, examined, and understood. Dramatic architecture and frankly gorgeous vistas are here, serving no gameplay purpose but providing scale and scope and beauty. Cyan’s journal fetish is truly and sensuously explored: there are tales of forgotten D’ni kings, DRC reports on the history of ages, and the diary of one seriously narcissistic DRC employee. There is chatting and friending and community formation, all intentionally obfuscated by the D’ni technology that serves as a user interface. Roleplaying is easy, because the game presents little that is non-diegetic: even the screenshot utility is an in-game device strapped to your wrist. The gameplay itself, while mostly focused on the puzzles that made Myst infamous, is oddly playful. Many of the puzzles are clearly designed to be easier with help: several obstacles can be bypassed entirely just by having a second person to stay behind or flip the right switches. There’s a way to craft scavenger hunts for other players to use, and an age, Jalak, dedicated entirely to unstructured play: players can spawn geometric forms that react to physics, and can make their own games on a shifting gameboard. This is an unrepentantly social game. There is no competition, but loads of cooperation. Several puzzles, including the pod puzzle and an orienteering puzzle, beg to be solved by large groups working together and sharing clues and techniques. The game is clearly intended for players to hang out in, to explore together, to chat about. Uru feels like a game made with little prior knowledge of how games are supposed to be. That’s my favorite kind of game: the sort that seems to come from a parallel universe, where games are different and better. Uru is deeply flawed, and it is unlikely that it will ever become what it was supposed to be. Cyan intends to make it at least somewhat open-source, to allow the community to enhance and expand it, but that seems a long way off, and it’s improbable that Cyan itself will ever manage to release new content for the game. For now, though, if you haven’t experienced Uru, you owe it to yourself and to its vision to try. The servers are overloaded, and you’ll have to try quite a few times to even log on. But it’s free, it’s magnificent, and there’s nothing like it. Give it a try at mystonline.com. If you find me in the cavern, I’ll show you around. My KI number is 00180887. Shorah. Damn! PC only! I’ll have to clean out my windows hard disk and GET THIS IMMEDIATELY!